Following a life-transforming near-death experience in Thailand (see detailed story below) Alan Field gave up a life of crime to follow his dreams and become a filmmaker, going on to win numerous awards including a Bafta for a script he wrote for BBC 1's 'The Street' a gritty series set in the North of England. 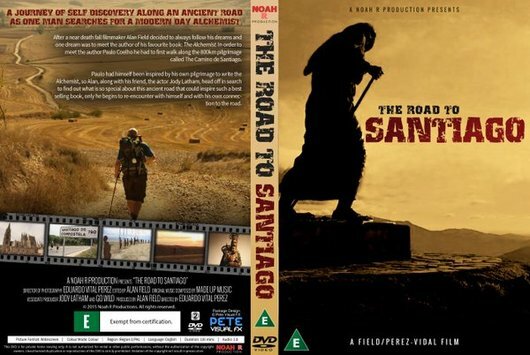 His film 'The Road to Santiago' which documents his personal journey of self-discovery along the Camino de Santiago is a culmination of a powerful inner calling to deepen his relationship with God and a divinely-inspired impulse to be a catalyst for other people's religious pilgrimages. He begins his journey following the footsteps of Paolo Coelho, anticipating a promised meeting with the modern day alchemist, and ends it having touched the Divine within himself. This film has already been screened in Chaplaincies in Kirkham prison, bringing hope to a number of in-mates. One prisoner, facing impending release after 20 years of incarceration and experiencing deep misgivings about his place in the world, felt inspired to walk the Camino in order to reconnect with life both outside and inside of himself. The film has also been shown to various youth groups in the church following talks given by Alan Field about his own life transformation. One 22-year old booked his own Camino just three weeks after watching the film. After arriving in Santiago de Compostela, this young man then decided to continue on and walk to Fatima! ﻿'18 years ago I was living a life of crime, riding high on the spoils of dirty money, worshipping fast cars and fast living. Involved in importing and exporting drugs, I gave little thought to what was right or wrong until a fateful day in 1998 when the person that I had been literally died, and a new man was re-born. On the recommendation of a friend, I took a holiday in Thailand. Three days into this trip at Kanchanaburi we journeyed to Erawan Falls, a stunning series of seven tiered waterfalls. On arrival, eager to get to the 7th tier, I followed a group of Thai children and German tourists, climbing the slippery surfaces while listening to rap music on my headphones. Needless to say, I was not paying attention to either the beauty of nature or the real dangers of the environment I was in. As soon as I screamed those words, I found myself falling again. My buttock hit a rock and my body shifted direction towards a dirty swamp with two huge boulders beneath the surface. Miraculously, I landed right between them and re-surfaced from the water punching the air! I came home from Thailand a transformed person and immediately set about writing my first script. People told me it would be practically impossible to get a first script onto television, but because of what I had experienced on the waterfall I didn't listen to them because I had faith. This faith was rewarded through a fateful meeting with well-known writer/producer Jimmy McGovern who 'just happened' to be looking for a sixth script in a particular genre for a series that eventually won British TV awards. Out of 120 other scripts written by seasoned writers, he chose mine.